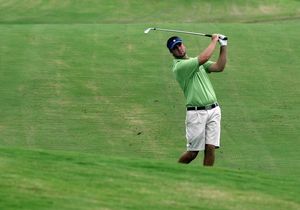 Chris Kennedy during a West Florida Golf Tour event in July. Photo by Tiffany Tompkins-Condie/Bradenton Herald. Following play in Tuesday's West Florida Golf Tour two-day event at the Ritz-Carlton Members Golf Club, Lakewood Ranch resident Chris Kennedy said he won't be going to PGA Tour Q-School this fall. The pre-qualification stage starts in mid-September, with Lake Jovita's South Course in Dade City as the only Florida venue during that phase. The deadline to submit the application was Wednesday, and the former Cardinal Mooney standout elected not to play this fall. Rather, he'll build off his professional debut at the WFGT event, where he placed in a tie for fifth and broke 70 in both rounds. The momentum from that performance should help heading forward, despite not winning the tournament where former three-time PGA Tour winner Robert Gamez captured after a course record 62 in Tuesday's final round. To read more about the record-breaking round, check out the full story here. Kennedy's sparkling amateur career concluded after he didn't qualify for the U.S. Amateur, which is currently in the round of 32 matches. He won the Sarasota City Men's Amateur for a second time in early May and continued his fine form in other top-level amateur qualifying events. Kennedy also excelled in WFGT events, while still as an amateur - losing a playoff in one tournament at Lakewood Ranch Golf & Country Club in early July.